Like many other types of investments, the major thing that you will want to show at the end of the process is a piece of paper. This is the same concept with real estate. The type of paper that you will want to hold at the end of the loan is either a title or a deed. This will allow you to show the locality that live in that you own the house and have paid off your loan. A title is a document or evidence that you own the property or home that you have been paying off. It can also mean that while someone else is on the property or land, an owner has the legal rights that are part of the property. When you have a title as a piece of documentation, it will usually be matched in the records of the locality that you are at as well as by the one who has sold the property. A deed is a similar type of documentation that will be used in the process of gaining a title. Often times, those who are investing in real estate will receive a deed as a transaction paper to the title. This shows that the person who will be getting the property has the right to the title as well as the right to the property. Usually, there will be several legal factors and regulations that are bound to this type of documentation in order to make sure that the transaction is fair. When you are about to receive a title or a deed for a home or piece of property, there are several steps you will have to take. First, a proof of insurance will have to be shown. You will also need copies that prove that you bought the house. The person who is selling you the home or property will also have to have these proofs for purchase. This includes a purchase agreement, invoices, receipts from the mortgage and proof of satisfaction that the one who is buying the property has met all of the requirements for purchase of the property. The last step to making your home completely yours is to make sure that you have the title or deed in your hand. By understanding the process of getting a title, and making sure that you walk into the final closing ready to make the exchange, you can own the piece of property that you have been working towards. Title is a generic term that refers to the legal evidence of ownership one has over a property. It includes such documents as Tax Declarations, Real Property Tax Receipts, Deeds of Sale, and the Torrens Title. What we normally think of as title is actually a Certificate of Title also known as the Torrens Title, which results from the Torrens System of Land Registration. The Certificate of Title is the best form of evidence of land ownership. The following are some of the most commonly encountered questions on Land Title and/or Land ownership in the Philippines. 1. How can one acquire Land Title? The easiest is through sale and by executing a document called Deed Of Sale, which shows the legal transfer of title from the name of the seller to the buyer. The Deed Of Sale is then taken to the Registry of Deed to be officially recorded. This type of title is also called Transfer Certificate of Title. Administrative proceedings – by a filing an appropriate application for patent (e.g. homestead) in the Administrative body (DENR) and registration of this patent becomes the basis for issuance of the Original Certificate of Title by the Register of Deeds. 2. Are there lands with no Land Certificate of Title yet? Alienable or disposable (A & D Lands) – those that can be acquired or issued title. The Philippines Constitution provides that only agricultural lands can be disposed of to private citizens. Non-alienable lands – includes timber or forest lands, mineral lands, national parks. No title can be issued over any portion within this area. 3. Can a foreigner have the Land Title in his/her name? Unfortunately, the answer is “No”! 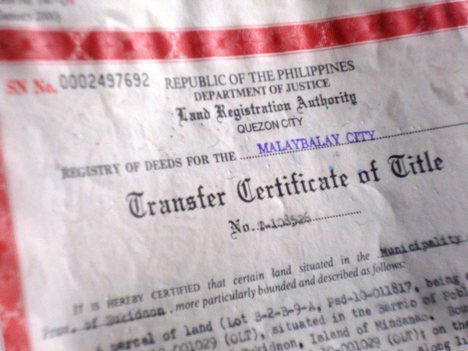 Land Title can only be put in the name of a Filipino or a Corporation with at least 60% Filipino ownership. As a foreigner, it would be helpful to be aware of this limitation on your right of owning Land in the Philippines. Please refer to the article that discusses land ownership in the Philippines made especially to the foreigners.